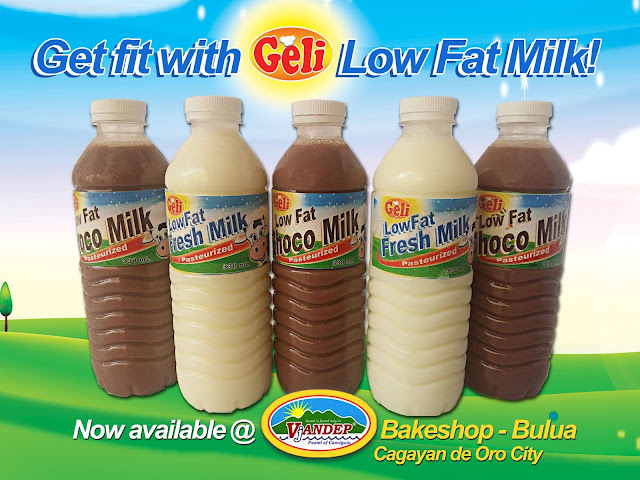 Geli Foods recently launched its Pasteurized Low Fat Milk Line with Geli Low Fat Fresh Milk and Low Fat Chocolate Milk. With fat content between 0.5% and 2%, it is the favorite drink of people who want to lose weight. Packed with calcium and protein, it is also the ideal drink of bodybuilders! Geli Low Fat Fresh Milk and Geli Low Fat Chocolate Milk are available at Vjandep Bakeshop, Bulua, Cagayan de Oro and Lions Gym, Tandag City.